PaizoCon 2019 is quickly approaching—join us in Seattle, WA over the four-day Memorial Day weekend and play games, attend seminars, roll dice, shop—and celebrate all things Paizo! 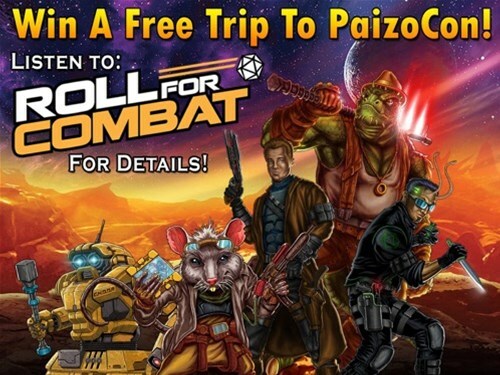 The Roll For Combat Starfinder actual play podcast sent multiple people to PaizoCon 2018 for free, and this year they’re at it again. They’re also expanding their contest and making anyone in the world eligible to win a trip to PaizoCon 2019 in Seattle! For those unfamiliar with Roll For Combat, the podcasters are playing their way through the Dead Suns Adventure Path, as well as the occasional Starfinder Society adventure. They also regularly host Paizo guests on their show—both as interviewees and as guest players. Over the years the show has hosted Erik Mona, The Order of the Amber Die, Thurston Hillman, John Compton, Stephen Radney-MacFarland, Jason Keeley, Amanda Hamon, James Jacobs, and more. Some of them even developed new Starfinder gear just for the show (which you can download for free from the Roll For Combat Discord channel).